The Ombra Altana is a new installation that celebrates identity, architecture and aperitif. Presiding over a corner of South Hackney, at Ombra by the Regents Canal, the Altana elevates the everyday life of meeting, talking, eating and drinking. Launching as part of The London Festival of Architecture, and during the Venice Biennale, this simple structure will transplant the identity of Venice to East London. The Altana has its roots in 15th Century Venice, as a simple rooftop terrace addition, often made from leftover scaffold or timber, that would capture the wind and the sun. Quickly, it surpassed the everyday tasks of drying laundry and became a transformational space where people would gather and relax. The Ombra Altana, decked in Aperol-coloured flowers and drapery, will emulate the convivial spirit of Venice with a usable west facing elevated terrace functioning as a place for meeting, a venue for dining and a fine place to drink Spritz over gas holders, canals and Cambridge Heath Road during the summer. 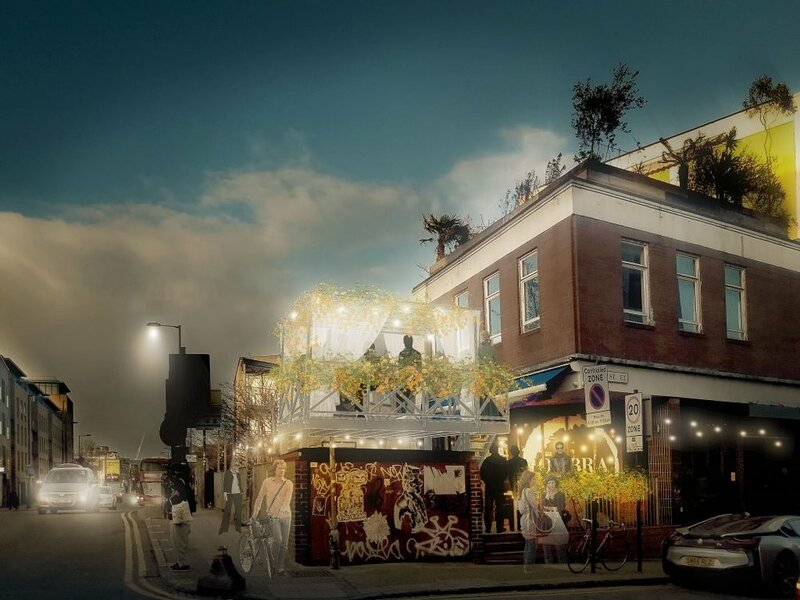 This local and collaborative project is designed and built by Hackney based architects fourth_space (owners of Ombra and Vyner Street residents) and The Office for Crafted Architecture (EXYZT collective, Central Saint Martins).